I wanted to let you in on a little secret for locating free genealogy charts. If you know where to look, there are some really good sources of PDF charts and forms available for free download. With the prevalent use of PDF documents and availability of the Adobe Acrobat reader, PDF documents are a great way to display and share your genealogy data. Personally, I have never really been satisfied with the charts built into the Family Tree Maker software I was using. They always seemed to have formatting issues and the charts never looked quite right. My dissatisfaction led me to seek out a better way to display my data that looked good in printed form. One place to find downloadable PDFs is the website of Misbach Enterprises. According to their website, Grant L. Misbach founded Misbach Enterprises in 1958, and has been supplying the genealogy community with charts, software and other genealogy supplies for over 50 years. 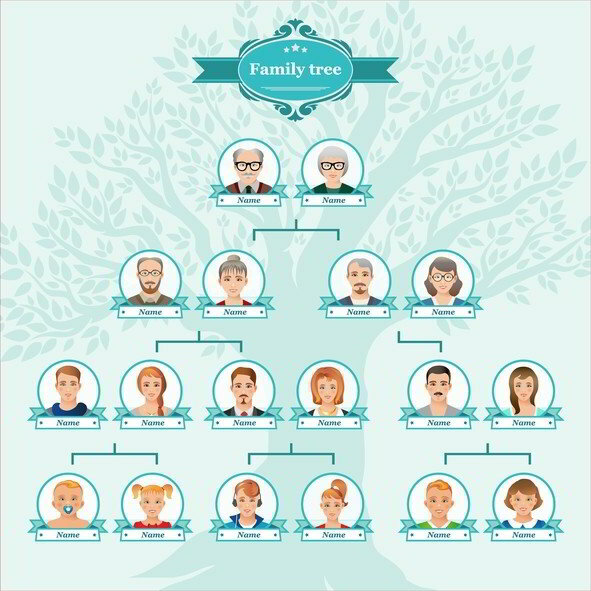 They provide free downloadable PDF versions of most popular genealogy charts including pedigree, bowtie, fan chart, and family group record sheets. To download the free genealogy charts, just go to their website at http://misbach.org/free-pdf-charts.html and click on the picture of the chart you want to download. Once transferred on to your hard drive, open them in Adobe Acrobat and fill in the chart with your own data. You can save your data inside the PDF and come back later to make changes. 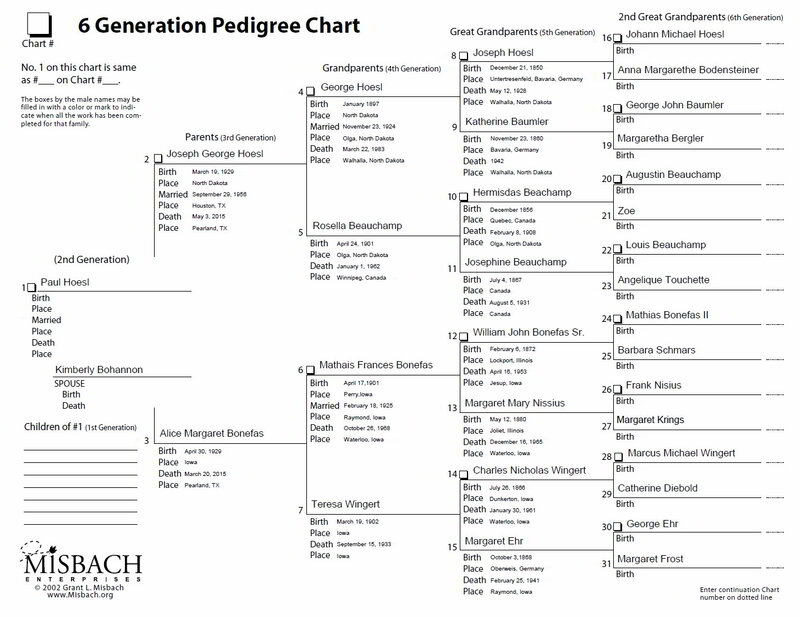 Below is an example of a pedigree chart filled out with my family’s information filled in, so you can see what the chart looks like when printed out. That is a whole lot of genealogy information packed into a 8.5” by 11” piece of paper. The pedigree format makes it really easy to share your most important information with family members. Another good source for free downloadable PDF charts is Family Tree Magazine. They not only have charts, but also blank forms including census, immigration, deed index, state marriage, military and cemetery. Their charts and forms can be downloaded from http://www.familytreemagazine.com/freeforms. Like the charts from Misbach, once downloaded, the PDF can be load in Adobe Acrobat reader and customized with your own family information. What I find so appealing about these free genealogy charts is the ability to display a lot of information in a clean, professional and eye appealing way. You can buy some quality paper and print charts out for family members; I can almost guarantee that you will be the most popular person at your next family gathering.